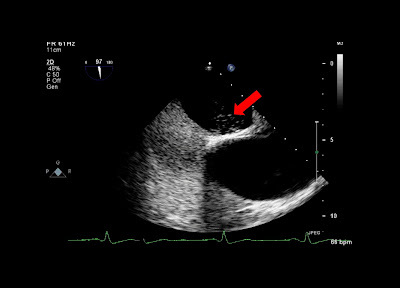 Saline bubble contrast echo studies, sometimes called agitated saline studies, are used in echocardiography to test for the presence of a right-to-left shunt at the intracardiac or intrapulmonary level. But what's the best way to perform such a study? Here are some tips. In order to perform a saline bubble contrast echo study, we need to create macroscopic bubbles in a syringe of saline. To prepare this, we draw up 8 mL of sterile normal saline in a 10 mL syringe, plus 0.5 mL of room air. We also add 1 mL of the patient's blood to the mixture, which helps create smaller bubbles and thereby provides better opacification of the right atrium. To create the macroscopic bubbles, the saline/air/blood mixture needs to be agitated, and this is effectively done using a second 10 mL syringe attached to the first syringe via a 3-way tap. Always use Luer-lock syringes to avoid one of the syringes becoming detached and spraying everyone with the mixture! By agitating the saline/air/blood mixture back and forth between the two syringes, a suspension of macroscopic bubbles is created. This is the saline bubble contrast. This contrast is then immediately injected as an intravenous bolus via a cannula in an antecubital vein (ideally at least 20-gauge), while the echo images are obtained. A saline bubble contrast procedure can be performed during transthoracic or transesophageal echo. An echo window should be chosen that gives a clear view of both atria and the interatrial septum. If the patient is suspected to have a persistent left-sided superior vena cava, then both left and right arm injections should be used to help clarify the diagnosis - in PLSVC, a right arm injection will opacify the right atrium normally, but a left arm injection will opacify the coronary sinus before the right atrium. The timing with which bubbles appear in the left atrium (if at all) should be noted. With an intracardiac shunt (e.g. a patent foramen ovale), bubbles will normally appear in the left atrium within three cardiac cycles of the right atrium opacifying. However with an intrapulmonary shunt, there will normally be at least five cardiac cycles before bubbles appear in the left atrium. Useful guidelines on the performance of contrast echo (including both saline bubble contrast and also transpulmonary ultrasound contrast agents) have been published by the ASE and can be found by clicking here. If you enjoy this cardiology blog, you can sign up to the e-mail list and get every new blog sent direct to your inbox. Signing up is quick and easy - just enter your e-mail address in the box below and click 'subscribe'. Article is quite good. Pegasi Media is a b2b marketing firm that has worked with many top organizations. Availing its email list is fast, simple, convenient and efficient. Appending services adds the new record as well as fills up the fields that are missing. Pegasi Media Group also perform Data Refinement, Data building, Data Enchancement, and Data De-Duplication. Database marketing is a form of direct market in which the customers are contacted through their email addresses with the help of the database. There is a scope for email marketing to generate personalized communication with the clients in order to promote your sales. Hi, I want to say realy amazing informative article. You are doing good job. You explain microscopic bubble well. Thanks to shared about this information. If you want to reach cardiologist email list contact Top Healthcare Leads.